Wow! What a trip! 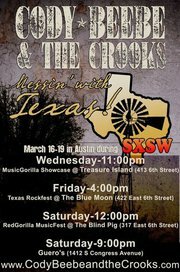 SXSW is truly a music lovers paradise. Well, Austin alone is a music lovers paradise, but inject the city with thousands of bands, even more fans, and as much free Monster energy drinks a boy can handle and BAM! You’ve got it made! The day we drove into Austin and parked the van to check out the city for the first time as a band, was like falling in love with a first crush. With the 85 degree weather, the sweet smell of blooming Russian Olive trees, and the faint sound of live music in the distance, we were hooked. Austin happens to be the birthplace of Stevie Ray Vaughan, Jimmie Dale Gilmore, Willie Nelson, and many others so you know there is harnessed musical energy flowing about the city. We had the pleasure of meeting so many great people and making lasting connections. The band played at Treasure Island on Wednesday night and had a great response! The place was packed and the people were grooving to our sound. We had Thursday off to walk around and hang out with other Seattle musicians including Lotus Crush and Eclectic Approach. 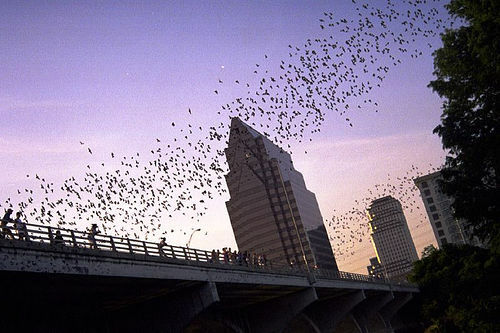 Not only is Austin home to great music, but it also hosts the largest migrational urban bat colony in North America. During the spring and summer months, you can catch the fuzzy winged creatures flowing out from under the Congress Avenue Bridge. The bridge was constructed in 1980 and, unknowingly, became the home of 1.5 million bats for a few months out of the year. This is truly a natural spectacle to see if you ever are lucky enough to travel to Austin.